Ecoustik is a truly sustainable acoustic dock and showcases our affinity and passion for design, woodworking and technology. Ecoustik™ dock flaunts the natural beauty of North American hardwood. 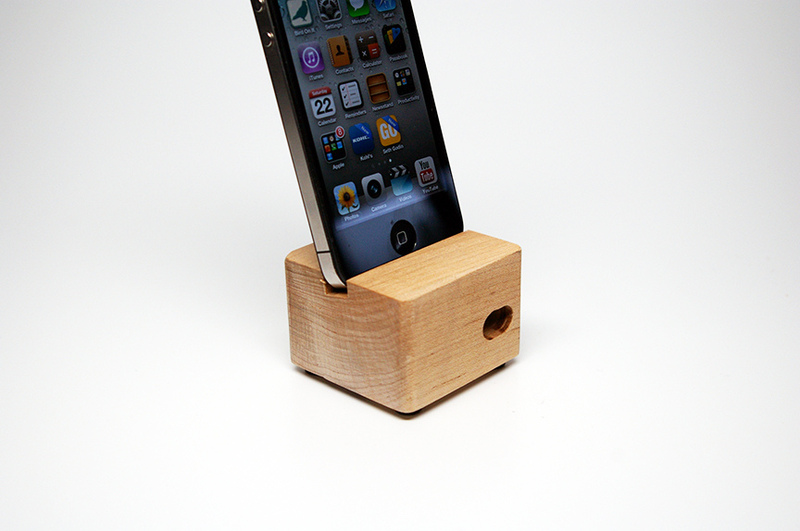 Designed to enhance and complement the Apple device it holds while being an environmentally friendly sound solution. All of the wood used to produce Ecoustik™ docks is either salvaged or harvested with sustainable methods. Our manufacturer uses sustainable practices in their business model each and every day. Each Ecoustik™ is meticulously crafted by woodworkers of the 21st century utilizing CNC machinery to ensure each Ecoustik is milled to exact specifications. Once crafted each Ecoustik is hand finished with non-toxic, environmentally friendly, naturally pressed oil from the fruit of the Tung tree and prepared for shipment using minimal packaging. 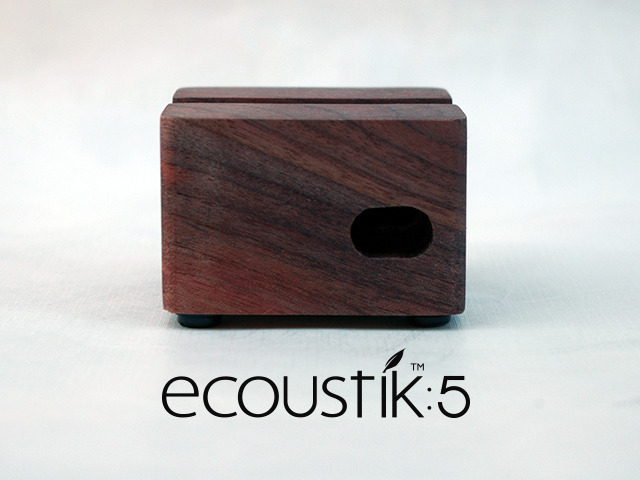 Each Ecoustik dock is unique and one-of-a kind due to wood grain patterns. 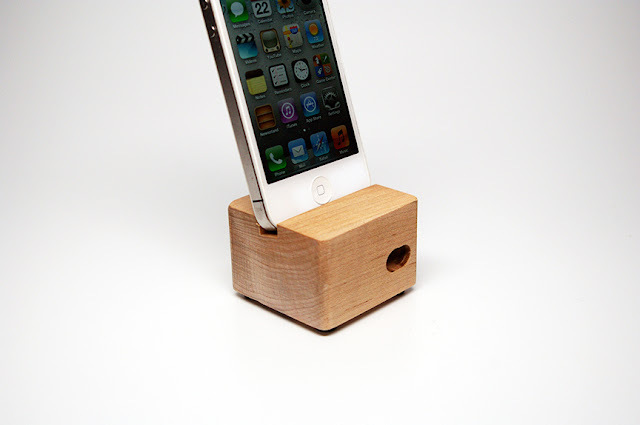 The Ecoustik iPhone/iPad docks merge design, music, woodworking and tech into a single, sustainable, eco-friendly acoustic device that amplifies your tunes while keeping your phone propped up to charge. Made from salvaged or sustainably harvested hardwood, each CNC milled dock is unique with its own grain pattern and natural color variations. 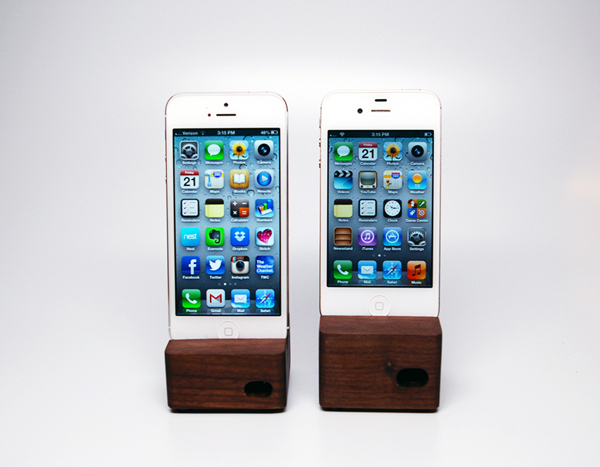 Available in a number of handsome wood types, it’s the perfect acoustic compliment to your iPhone 5, 4, 4S, or iPad! Get it here! An acoustic iPhone dock made from salvaged or sustainable wood that naturally amplifies sound. Designed in house and crafted in the USA by skilled woodworkers and craftsmen using sustainable practices. Hand finished with an all natural, non-toxic tung oil to bring out the wood's natural beauty. 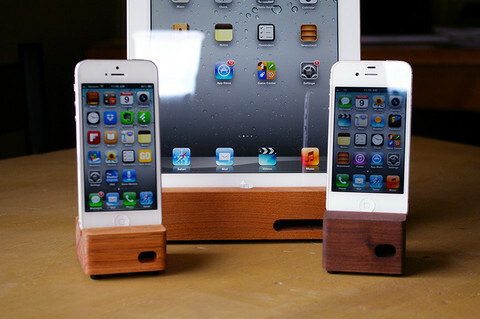 Each Ecoustik dock is unique so color and wood grain will vary. 1for1 program: We plant one tree for every board foot (12″ x 12″ x 1″) used to produce Ecoustik docks and other wood designed products. We are committed to minimizing our impact on the environment.